Seeging for brake release bolt. Spring washer holder on battery frame. Bourdon tube to coupling go. Hosest. Tube to coupler. go. 1 F 29 001 Pedal bearing pedestal a.A. a.A.
0 F 29 005 Pedal bearing block R.L. a.A. a.A.
5 F 29 007 clutch pedal a.A. a.A.
0 F 29 008 Coupling pedal R.L. a.A. a.A.
8 F 29 013 brake pedal a.A. a.A.
0 F 29 015 Brake pedal R.L. a.A. a.A.
22 D 25 261 protection cap a.A. a.A.
R23 F 29 029 Cuff R.L. a.A. a.A.
24 D 25 258 retaining ring a.A. a.A.
0 F 29 031 repair kit a.A. a.A.
0 F 29 037 Piston rod R.L. a.A. a.A.
0 F 29 044 snubber a.A. a.A.
44 F 29 046 guide sleeve a.A. a.A.
48 F 29 048 snubber a.A. a.A.
0 G 29 012 toothed lock washer a.A. a.A.
50 F 29 049 Holder, over-centre spring a.A. a.A.
0 G 22 016 Screw,M.damper on engine mount a.A. a.A.
52 D 29 067 pressure rod a.A. a.A.
57 D 29 072 locking nut a.A. a.A.
59 D 07 416 locking washer a.A. a.A.
61 D 29 055 bearing race a.A. a.A.
64 F 29 058 mounting support a.A. a.A.
0 F 29 059 Holder R.L. 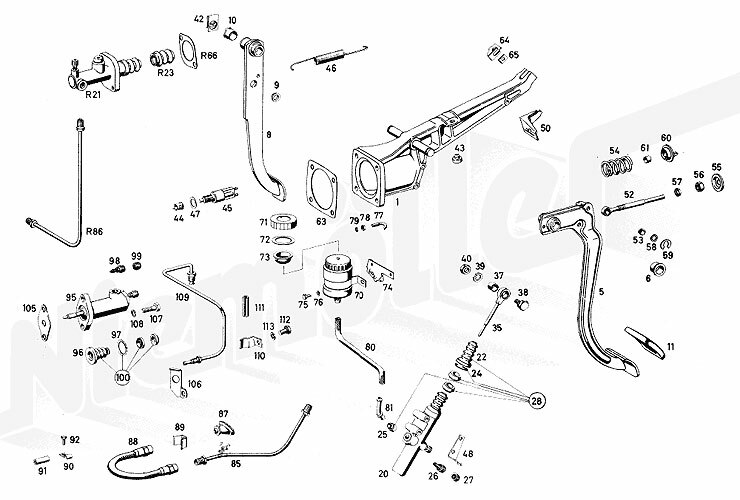 a.A. a.A.
65 F 29 060 Supplement a.A. a.A.
R66 F 29 061 Seal Axle R.L.Encoder Cyl./Face Wall a.A. a.A.
0 F 29 062 Stop R.L.f.clutch pedal/Lagerbo. a.A. a.A.
72 D 29 122 Sealing ring a.A. a.A.
74 D 29 135 Holder R.L. a.A. a.A.
75 G 68 034 sheet-metal screw a.A. a.A.
77 F 29 080 tensioning screw a.A. a.A.
0 F 29 039 Intermediate piece, master cylinder a.A. a.A.
0 E 27 040 distance sleeve a.A. a.A.
85 F 29 083 Cable, Coupling cyl. to K.hose a.A. a.A.
0 F 29 084 Conductor R.L., Coupling cyl. for K.hose a.A. a.A.
0 F 29 085 Pipe R.L. (from equilibr. to encoder cylinder) a.A. a.A.
89 D 25 233 Bourdon tube to coupling go. a.A. a.A.
90 D 29 198 fastening clip a.A. a.A.
91 D 25 232 Hosest. Tube to coupler. go. a.A. a.A.
0 G 30 028 sheet-metal screw a.A. a.A.
96 D 25 208 protection cap a.A. a.A.
97 D 25 214 zacker ring a.A. a.A.
0 D 25 208 protection cap a.A. a.A.
0 D 25 214 zacker ring a.A. a.A.
0 D 25 209 protection cap a.A. a.A.
0 D 25 215 tension ring a.A. a.A.
106 D 25 221 Holder for hydraulic oil line a.A. a.A.
0 D 25 223 Holder for hydraulic oil line a.A. a.A.
109 F 29 070 Cable, slave cylinder for hose a.A. a.A.
0 D 29 178 Pipe from K.g.g.zyl.z.K.hose R.L. a.A. a.A.
110 D 25 228 mounting support a.A. a.A.
0 D 25 230 mounting support a.A. a.A.
0 F 29 097 Holder R.L. Tubular coupling housing a.A. a.A.
111 D 25 232 Hosest. Tube to coupler. go. a.A. a.A.